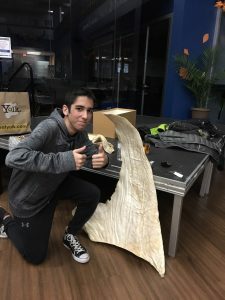 Teens posing with a large shark fin. We recently had the good fortune to have two researchers from The Field Museum (in Chicago) come out to Naperville for the Huskie Science Café. Dr. Kevin Feldheim studies the mating patterns of sharks and Dr. Dylan Maddox who studies bird species of Peru came along in support of his colleague. Both researchers began the evening sharing food and stories with our TSCN Board and this morphed into a coffee-house style discussion with early arrivals to our event. In all we saw upwards of 75 people attend the event including some who traveled as far as 30 miles to meet the researchers. Kevin’s main talk centered around the events that led to his research including the most minor of shark bites ever recorded! Kevin spoke on a wide range of topics including basic science and biology, the mating habits of sharks, the illegal harvesting of shark species, as well as his thoughts on what high schools should be teaching their students. Students engaged in question and answer sessions throughout and what began as a 15 minute speech quickly became a 45 minutes open forum with both researchers stepping in for discussion on sharks and biology. Kevin brought a myriad of samples from his work including a giant fin seized in a legal procedure, jaws of sharks, rostrums of saw-fish, gill-nets, and tracking probes that he uses in his research. 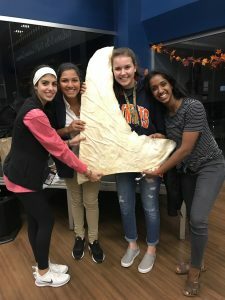 Quite a few students took selfies with the giant shark fin so it may have been the most tweeted about part of the event!